Consider a typical day in our neighborhood: there is always something happening, something new, something changing. One constant will always be Bushwick's art scene. Every weekend of the past year brought us a show or two to see, from Beat Nite to Bushwick Open Studios, the Exchange Rates international expo and every opening in between. Now, in no particular order, here's a recap of our art contributors' favorite shows from 2014! Microscope Gallery went through a major transition this year, expanding from their tiny space (hence the name!) on Charles Place, to a larger venue over on Willoughby Avenue. And with the the support of the community, was able to continue its special programming as well. 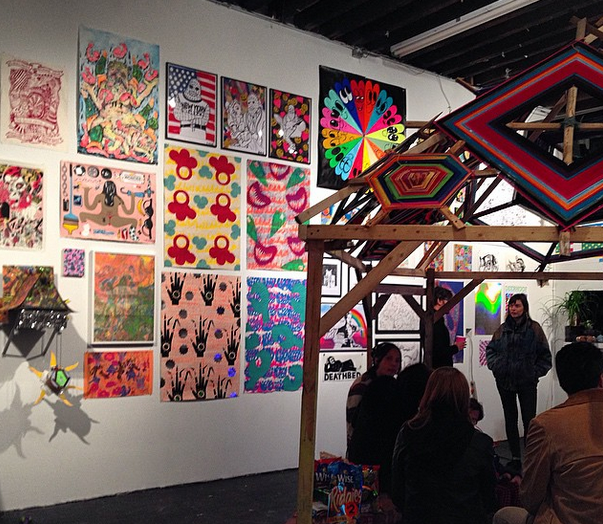 Two shows, one from each phase of the gallery, had a huge impact on my memory of the Bushwick art scene this year. The first being “Detours,” by Anita Thacher: this show is resonating with me again at this point in the year, as I saw it at the beginning of 2014, right after New Years resolutions were made and goals were set high. As that time of year rolls around again, I remember the importance of Thatcher's abstract paintings; map-like, with lines and shapes running of the canvas. At the time the paintings reminded me not to be afraid of new, unexpected direction, and the joy one can find in being lost. The inaugural show in their new space this past September, titled “Slide Slide Slide,” signaled a new beginning and wonderful things to come for the gallery. 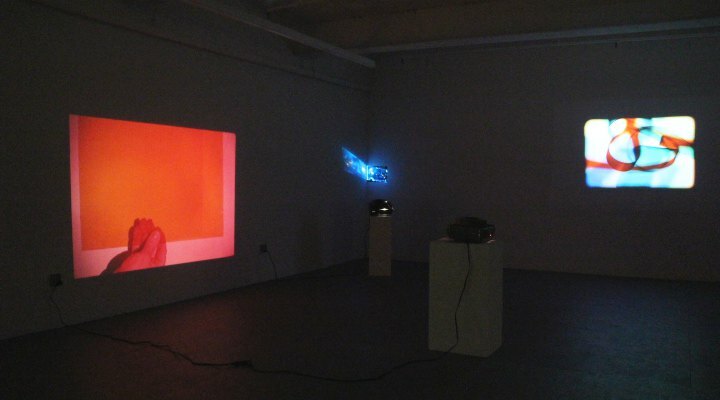 "Slide Slide Slide" showed off the gallery’s expertise and devotion to curating and displaying projection art. Every inch of the space was beaming with a pulsating vibrant light, with each piece telling a different story and radiating in the darkness, creating an exciting and enlightening vibe. If there’s one thing I love, it’s when an artist can rock your sense of space and “normalcy” so far off its normal track, you feel as though you’ve entered a new world. No one did that better this year for me than Hans Van Meeuwen at Storefront Ten Eyck, which opened during Bushwick Open Studios. In his show, “The Civilized World,” a smattering of surreal sculpture was strewn about the gallery space. 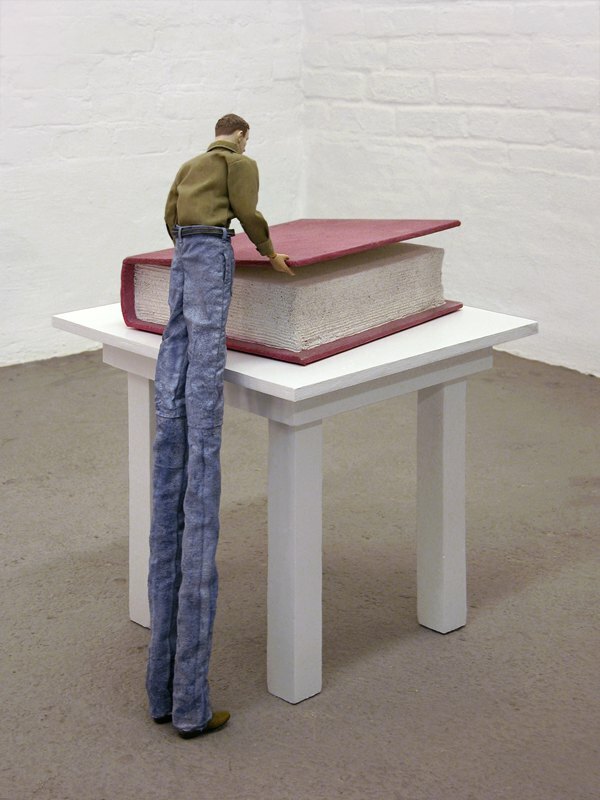 A small sculpture of a man stood in the front of the space, however the man’s foot was considerably bigger than the rest of his body, jutting out of his leg and pooling onto the floor, like sand being poured from above. A giraffe’s head is disembodied and upside down. A nose, pinocchio-esque, pokes out from a face on the ground. This exhibition allowed the viewer to dream up caricatures and other realities. And in a world where we are beginning to accept things like murders, injustices, and political unrest as something “normal,” and yet scoff at a sculpture of a man with a super long neck as being “not normal,” the show continues to make me wonder what I want to accept as “normal” and what ideas and events I refuse to accept as such. This past summer SIGNAL allowed itself to be completely taken over by the loosely connected Noodle Beaches for Meeting Witches, transforming the cavernous space into an enclave of tents, huts and other makeshift, shrine-like structures in the "Small Worlds of the Claiming Moon" exhibition. In a review of the show, artist Alex Dyck explained to Bushwick Daily that rather than be considered a collective, the group of artists prefers to be thought of a constantly shifting and transforming community of artists that are interested in the mystical and the transcendental. In the sweltering days of high summer, this exhibition opening still resonates in my head as one of the sweatiest, rowdiest and most interesting openings this year. 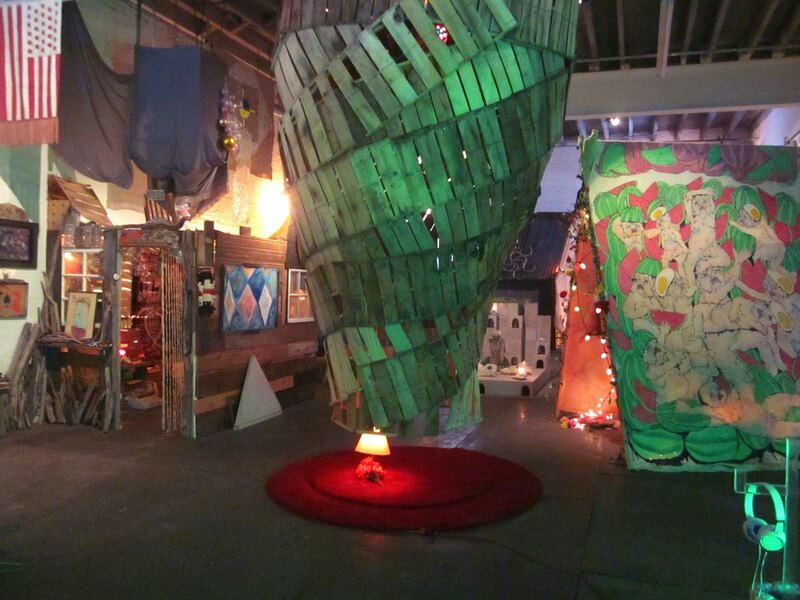 The exhibition combined elements of art happenings of the 1960s, performance, and the DIY Bushwick arts aesthetic. Each structure was unique and viewers could enter into the space and consequently be transformed into a completely different environment. Disparate yet unified in their shrine-like nature, each space became a haven and space for interaction between gallery-goers, the artists and the space itself. I see this chaotic unity as something very representative of Bushwick right now, and this exhibition reflected this sentiment perfectly. 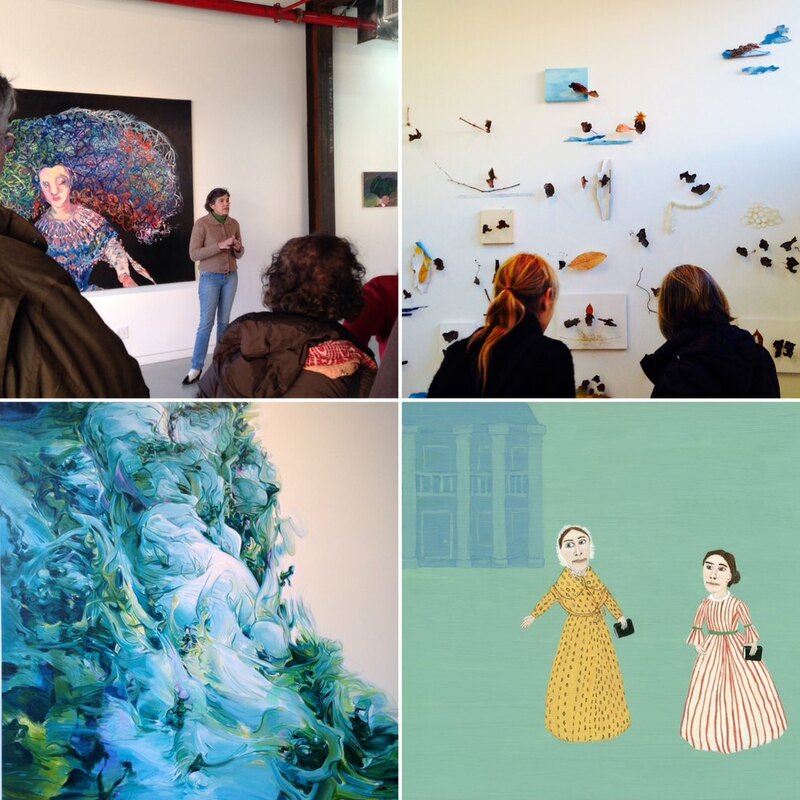 Newcomer ODETTA Gallery joined the Bushwick art scene in 2014 with a space over on Cook Street just off of Bogart. In the last show of the year, titled "Becoming," we were treated to fanciful endeavors of the canvas, from big heaps of brushstrokes in Deborah Brown's historical references to Gregory Curry's sci-fi pejoratives and spilling of delicious colors. ODETTA held a special artist talk around this exhibition where we got to hear from Brown and Curry as well as Mary Dwyer and Alice Momm. The artist talk made the experience feel like looking through the art history telescope, revisiting folk art traditions in Dwyer's works and taking a back-country nature stroll through Momm's delicate plant materials. An all-enveloping experience of sorts took place inside Fresh Window gallery during their fall exhibition of "Nightlight." 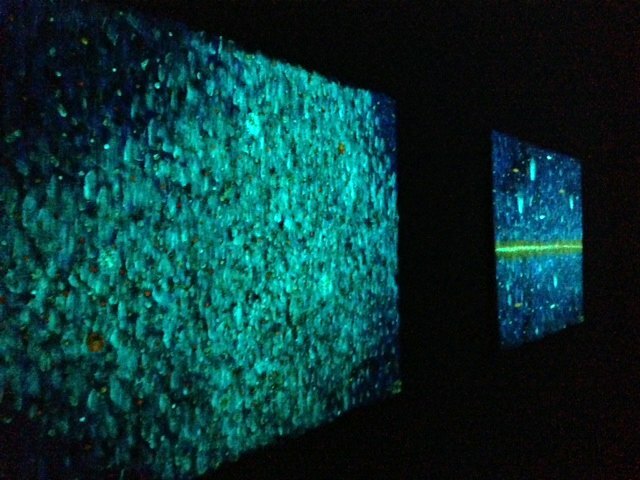 Featuring Marc Egger's phosphorescent abstract paintings lining the walls around Maya Ando's central installation of a small pool of water and delicately placed petals. The works ignited a feeling of being surrounded by stars and the ocean, because as the show carried on, the gallery lights slowly dimmed until a pitch black dark enveloped the space and caused you to consider light, darkness and all of the things we see but do not touch. A live interactive performance by Benjamin Heller took place inside the gallery in October, titled "Waterlines" which Terri attended and then shared how glow-in-the-dark art sheds light on human behavior. 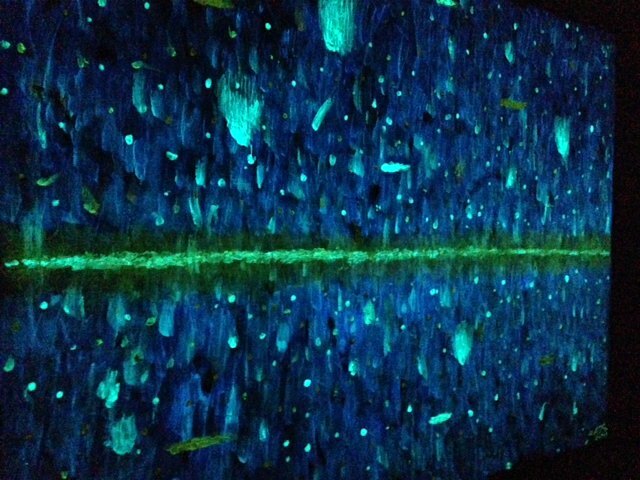 In he experience she described how "walking around the stiff, concrete room begins to feel like moving through a forest around a still pond at night." Nestled in a Bushwick Avenue brownstone is a 6 bedroom apartment that leads a double life as a bi-level gallery. The Hollows welcomes artists from all over the world (their first show included almost 20 artists from a plethora of countries) and collaborates with them to transform the space into an immersive gallery experience. 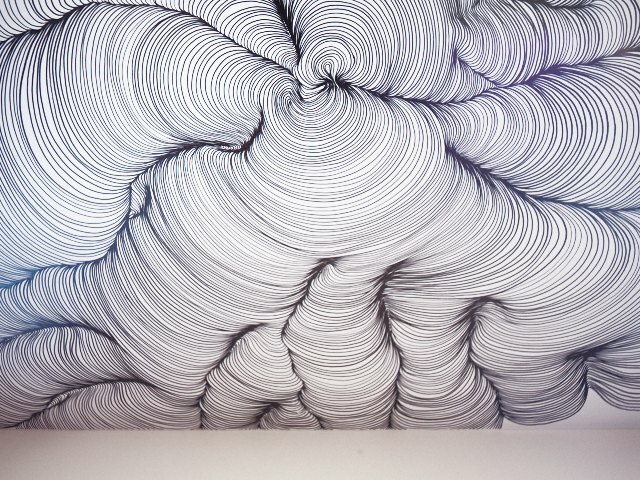 If you haven't already stopped by, be sure to check out one of their permanent pieces – a giant Sharpie-drawn ceiling mural created by Brazilian artist Talita Zaragoza. Walking into this show at English Kills was like walking into a delightful nightmare. In ‘For Thinkin’ Long and Dark,’ Brent Owens displayed a found objects of mostly stumps, branches, and other forestry items, re-worked with his own additional sculpture, drawings, and paint. Stumps and other wood cuts were adorned with slinkies, paint, metallic objects, eyeballs, pink hair, hot dogs, and other colorful objects, giving some of this natural mater an anthropomorphic quality, and making them seem like they might have just landed in our world from another galaxy. What I found most mind bending were a series of otherworldly found tree stumps, lit up from the inside with neon lights and paint. These pieces featured a delicious combination of organic and synthetic materials, and took the viewer's imagination to new heights. 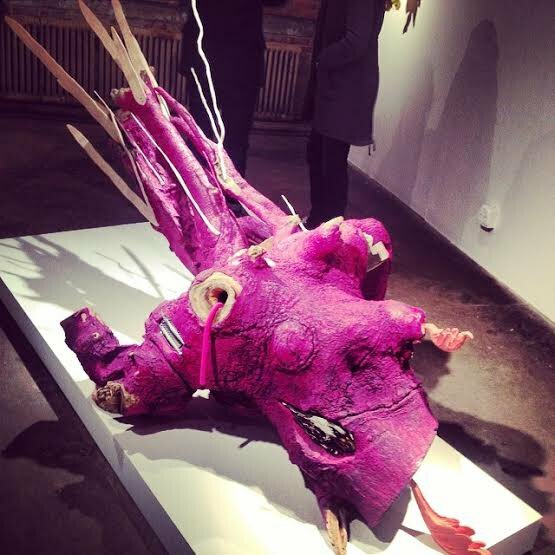 This show for me was hands-down the most visually exciting show in Bushwick this year. This past November at Secret Project Robot, Bushwick's institute for the living arts, artists, designers, musicians and programmers all came together to present "Headshop: A Psychedelic Group Art Show." Illustrations, blacklight posters, tapestries, comics and video games filled up the space - allowing visitors to interact with the installation. Among the artist lineup was two of my favorites – Killer Acid (fun fact: showed up at his studio 3 years ago via Etsy to buy t-shirts to give as gifts) and Sto Len (check out his version of paper marbling), who are both Brooklyn-based and crazy talented.